Charlie Simpson-Daniel, younger brother of Gloucester and England wing James, has won a call-up into the England Sevens squad for the Wellington and San Diego Sevens. His elder brother was a finalist in the Hong Kong Sevens in 2002 before making the step up to full international level. 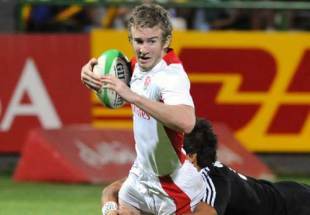 Simpson-Daniel is joined in the squad by newcomers Dan Norton of Gloucester and Ben Jones of Worcester as Sevens coach Ben Ryan looks to decide on his squad for the Sevens World Cup in Dubai on March 5-7. "These three have been given an opportunity to fight for World Cup selection," said Ryan. "The Wellington and San Diego tournaments are our chance to continue the hard work that we've put in over the last six months. We've kept consistency with our squad over the last three tournaments and the inclusion of Dan, Ben and Charlie means there's even more competition for World Cup places and I'm sure they will relish the challenges ahead." England welcome back Ollie Phillips to their squad after injury as they look to build on their current third place position in the IRB World Sevens Series.